Today however, the IEA has backtracked, removing any reference to the higher-ambition scenarios, or to the 1.5 degree Celsius (°C) goal. This comes just a month after the Intergovernmental Panel on Climate Change (IPCC) released a powerful report showing both the critical importance of limiting warming to 1.5°C, and pathways for doing so. Holding the increase in the global average temperature to well below 2°C above pre-industrial levels and pursuing efforts to limit the temperature increase to 1.5°C. 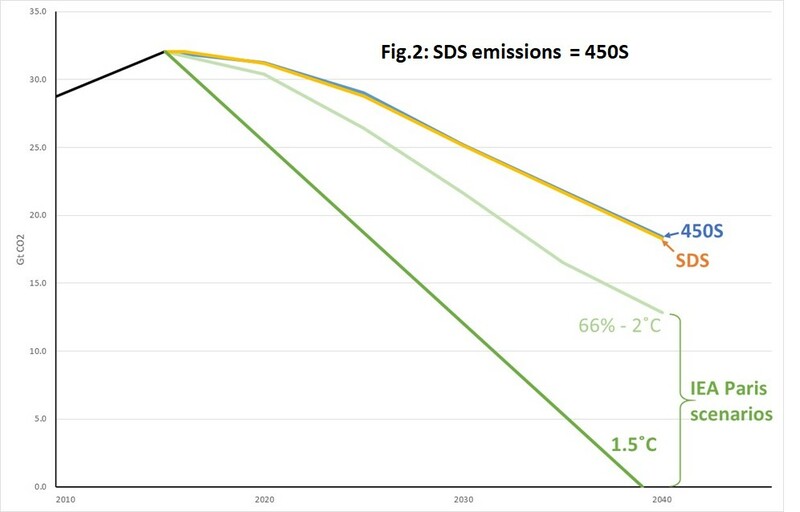 The IEA makes the 1.7 to 1.8°C claim by comparing the SDS with scenarios that lead to that amount of warming. As the IEA’s graph shows, those scenarios depend on very large-scale use of negative emissions technologies later in the century. 10 billion tonnes of CO2 removed by bioenergy with carbon capture and storage (BECCS), as in most of those scenarios, could require a land area devoted to bioenergy equivalent to half the world’s crop-growing area. If achieving the Paris goals is predicated on the later large-scale use of these technologies and they are not delivered at that scale, emissions to that point will be irreversible and climate limits broken. 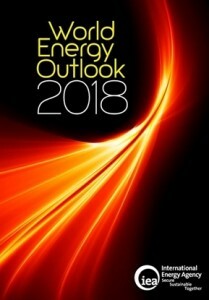 Previous editions of the WEO have warned that negative emissions are likely not feasible at this scale: WEO 2016 stated, “Such a situation is vastly removed from the realities of the current energy system, and the prospect is remote from today’s perspective.” WEO 2017 also cautioned that “all such technologies face severe technical, economic and resource constraints.” And climate scientists have expressed growing concerns about excessive reliance on negative emissions, as discussed in our recent blog. In contrast, the new WEO 2018 describes negative emissions technologies as one of the “important sectors for innovation,” and gives no warning about the dangers of over-reliance on them. Continued investment in oil and gas supply, however, remains essential even in the Sustainable Development Scenario to 2040, as decline rates at existing fields leave a substantial gap that needs to be filled with new upstream projects. Today’s flow of new upstream projects appears to be geared to the possibility of an imminent slowdown in fossil fuel demand, but in the New Policies Scenario this could well lead to a shortfall in supply. We estimate that around 16 billion barrels of new conventional crude oil resources would need to be approved each year between now and 2025 to avoid any potential “mismatch” between supply and demand. However, the average annual level of new resources approved in the three years since the oil price fall in 2014 was around 8 billion barrels. … The level of conventional crude oil approvals therefore needs to double if there is to be a smooth matching between supply and demand. Much of today’s media coverage can be expected to focus on the IEA’s projection that (in the NPS) oil demand will not peak until after 2040. This narrative of ongoing future demand will also drive ongoing investment in more oil.